Few blades are as efficient for chopping anything that gets in the way than a cleaver knife. Our Damascus Steel Cleaver Knife features a unique blade crafted with a simple black grip for efficient wielding and chopping. This cleaver sports a slight curve to the edge, which ensures it is a strong cutting and slashing blade. 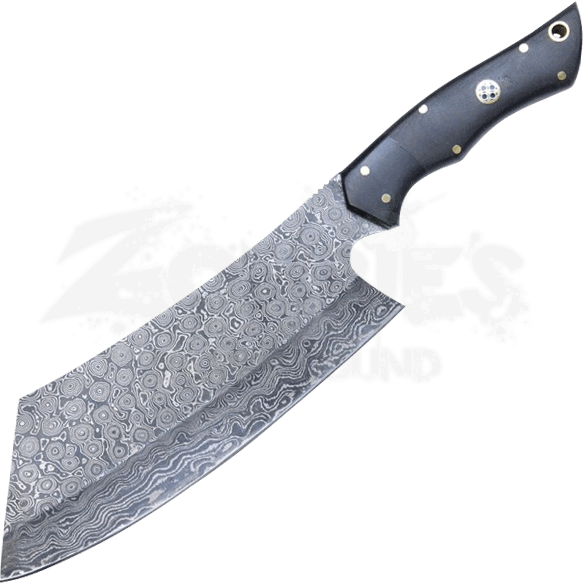 The Damascus steel used to make this cleaver has been folded several times to create 250 layers in the metal. A blade like this will have friends and family mesmerized by it whether you are using it or displaying it. Included with this knife is a brown buckled leather sheath making it easy to access and transport. This is the perfect item to add to your collection of knives, especially for those eager to include a cleaver to their set.